If your feet are always too warm, you'll want the best socks for sweaty feet on the planet, so your feet stay dry and comfortable all day. Whether it's due to warm weather, heavy shoes or all-day work schedules, sweaty feet can be incredibly irritating, as well as potentially unhealthy. Luckily for everyone dealing with such discomfort, there is an easy way out of such distress. From high-tech performance fabrics to natural fibers, the best socks for sweaty feet will keep you feeling comfortable, and might just convince you to throw out all your other socks the same day. Read on to review the many wonderful options. Are there really socks that keep feet dry? 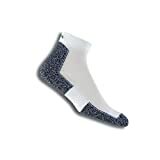 It is a little-known secret, outside of the performance apparel and recreational sports industry, that overheated, sweaty feet are rather easy to deal with, and all anyone really has to do is apply moisture-wicking, quick-drying fabric to socks and you're ready to go. The best socks that keep feet dry are made of fabric that speeds moisture away from the skin and dries quickly, which regulates temperature, regardless of whether it's hot or cold outside. This means they'll warm you in winter, and cool you in summer, and you'll be comfortable either way. They'll go even further than that by eliminating the growth of any odor-causing bacteria, which means that after a long day of hiking, biking, jogging, or wearing stuffy dress shoes, they'll smell almost pristine. Sound good so far? It is. 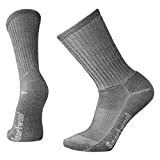 Backpackers, hikers, and other outdoorsy types have been using high-performance socks for decades, whether made from synthetic or natural materials, which provide the all-day comfort that seriously intense climbs require. Performance socks now come in all sorts of shapes, sizes, thicknesses, colors, styles, and other details, so no matter what sort of endeavor you are undertaking (even if it's just lounging around the house), you'll be much happier with comfy feet. Cotton, by comparison, soaks up moisture and stays wet throughout the day, gradually accumulating until you can barely stand it. Performance fabrics, on the other hand, will feel just somewhat damp after a long day, and will dry out in a matter of minutes, not hours. Oh, and they're softer than cotton, last much longer, usually have seamless toes, and are machine washable. Plus, they're usually more environmentally friendly. The absolute best fabric you can find to keep your feet comfortable and dry is merino wool. It may sound surprising, but when made thin enough to provide as little insulation as possible, they work wonders as summertime apparel. Merino wool does everything that typical performance fabrics are expected to do; it wicks moisture, dries quickly, regulates temperature, and eliminates the smell ordinarily found in sweaty socks. Since it absorbs moisture into the interior of the fiber, it can absorb a great deal before it starts feeling moist. It's naturally stretchy, durable, renewable, and very cozy. It won't itch like regular wool, and is one of the softest, comfiest things you can possibly find. 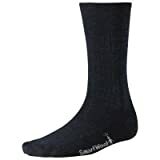 Merino wool socks are often blended with other materials, like elastic and nylon, to provide shape and durability, and come in a wide range of styles, weights, lengths, and other factors to suit all sorts of purposes. While it's hard to find anything more comfortable than merino wool for most conditions, sweltering summer temperatures or marathon training are sometimes better served by polyester, which will dry even faster than merino wool. Polyester provides excellent moisture management and faster drying times, though it tends to work better with more breathable shoes, so the moisture has somewhere to go (it can't absorb moisture like merino wool can, so it will feel clammier if the moisture can't escape). While neither material can completely eliminate the problems of perspiration, the difference is literally like night and day. Try out a pair, and you'll very likely never go back. 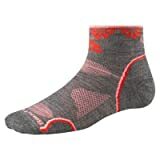 Smartwool is one of the biggest and most easily found brands, with literally dozens of different socks for all sorts of adventures, and they're quality products. Other brands include Wigwam, Thorlo, Icebreaker, Patagonia, and plenty of others. Since we're talking about eliminating sweat and keeping feet dry, it's probably best to start off with some lightweight options for hot weather, or hot working conditions. There are literally thousands of options available, with socks specifically intended for all sorts of sports, though the vast majority of these socks will work perfectly well in all sorts of situations, since the demands of each activity are largely the same. The thinner the sock, the more appropriate it might be for summer use, which can also be said for the percentage of merino wool, since it's an insulating material. Generally you can spot summer weight socks simply by looking at the height; ankle socks are almost always intended for hot-weather use. Summer socks should be about as thick as ordinary socks, though often they include padding along the bottom for extra comfort, which has very little effect on how warm they get. Click the options below to shop for more warm-weather socks that keep feet dry at Amazon. Click to buy online at Amazon! 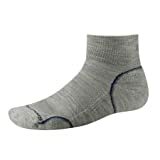 Although plenty of sock manufacturers offer "regular" socks for casual use, it is often much easier to find socks intended for hiking or camping, and buy them instead. 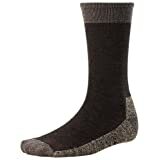 "Hiking" socks often make the best casual socks anywhere to be found, as they are made of materials to keep feet dry even during a lengthy hike up a giant mountain. When worn for casual use, they are incredibly comfortable, practically eliminating any overheating, sweating, or smell. The only real difference is that hiking socks are generally more padded on the bottom. In other words, a win-win. In the world of outdoor recreational sports, these socks are often branded, in order of increasing warmth and cushioning, "light hiking," "hiking," "backpacking," and "mountaineering." You'll do best with light hikers. 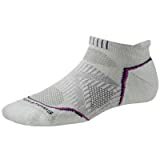 They will be the most versatile socks, comfortable nearly year-round, unless your winters drop below freezing and you plan on being outside for more than an hour at a time, or get particularly cold on a regular basis. If that's the case, you can never be too warm. Check out some of the best hiking socks below. They'll double as casual wear, and will keep your feet dry and comfortable through most of the year. Click to shop for more options online. Click to shop for more options at Amazon! So, to wrap up the recommendations, all you really need to do is find socks made of performance fabric, preferably with some merino wool if possible, as light as an ordinary sock. Once you try one of these, you might never go back to regular socks ever again. There is simply nothing to recommend them, as performance socks will outclass them any day. So, now that you know how to find the best socks for sweaty feet on the planet, you can be as comfortable as you deserve to be, and never worry about sweaty, smelly feet ever again. Enjoy! If "cold feet" is more than just an expression, you need the best wool socks. They truly keep your feet warm during the cold winter. The comfort of fuzzy socks. Quick dry jeans offer great comfort and low maintenance, turning jeans into great summer clothing for year round use. Find the best travel dresses, because there's no reason you can't look nice when you're traveling around the world.